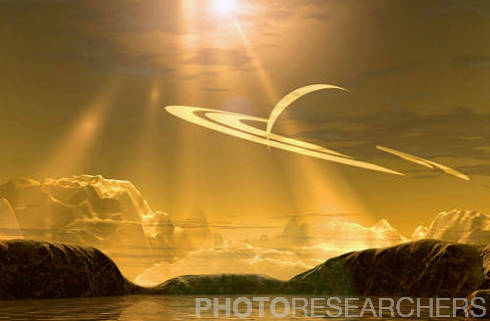 In the news: "Titan's Underground Ocean" by Dr. Tony Phillips NASA Science June 28, 2012 BF8117 Sun beams filter down on Titan, Saturn's largest moon. Credit: Steve A. Munsinger / Photo Researchers, Inc. In the news: "Swing flu outbreak 15 times deadlier than thought, study finds" By MyHealthNewsDaily msnbc.com June 25, 2012 BU6813 Flu virus A (H1N1). Influenzavirus A (H1N1) is of Orthomyxoviridae group. This virus is responsible for an infectious and contagious respiratory disease, with symptoms of fever, aches, strain, respiratory difficulties and cough. It can evolve to become pandemic. Viral diameter approximately 100nm. 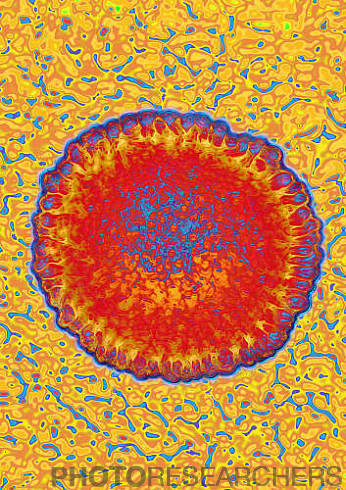 Viral magnification 1,000,000x at 10cm and image colorization with HDRI treatments on a Transmission Electron Micrograph view (TEM). Credit: James Cavallini / Photo Researchers, Inc. 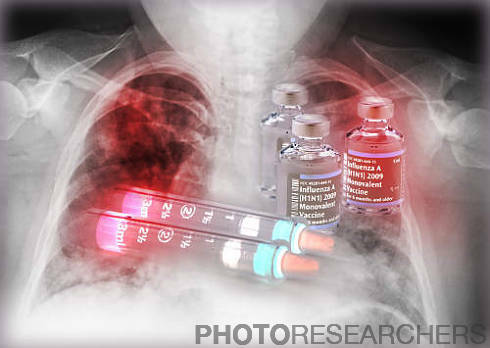 In the news: "More adults put off kids' vaccinations" by Nathan Seppa ScienceNews June 20, 2012 BR6494 Composite photo illustration showing H1N1 flu vaccine vial and box superimposed over the chest x-ray of a patient with influenza who developed pneumonia. Credit: Scott Camazine / Photo Researchers, Inc.
BU9231 Composite image of the planets (and Pluto) orbiting around the sun. Not to scale. Credit: Robin Treadwell / Photo Researchers, Inc. In the news: "EBay Plans Data Center That Will Run on Alternative Energy Fuel Cells" By James Glanz New York Times June 20, 2012 DA6470 Fuel cell drawing. 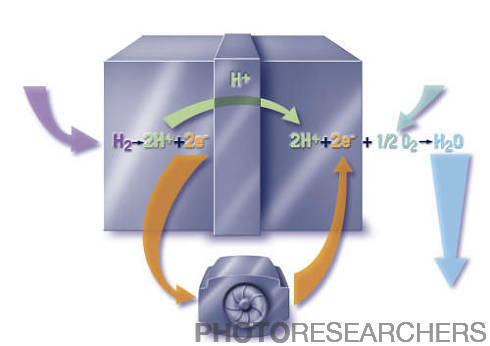 Illustration of how a fuel cell works. In the effort to reduce pollution, fuel cells have been developed for use in electric car motors. However, the problem of the over-sized hydrogen reservoir has yet to be solved. Credit: BSIP / Photo Researchers, Inc. In the news: "Why you can't get 'Call Me Maybe' out of your head" By Meghan Holohan bodyodd.msnbc.msn.com June 19, 2012 S6071 Headphones. 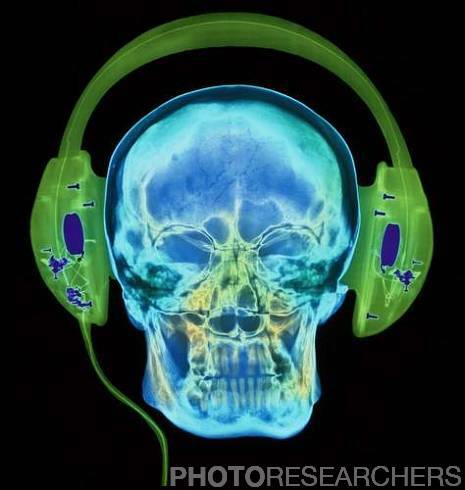 Colored X-ray of the head of a person wearing a pair of audio headphones. Bones of the face and of the rounded cranium of the skull are seen. The internal electronics of the headphones and the attachment lead are also visible. Credit: Gustoimages / Photo Researchers, Inc. In the news: "Taliban Block Vaccinations in Pakistan" by Declan Walsh New York Times June 18, 2012 2S4043 Color enhanced Transmission Electron Micrograph (TEM) of the polio virus. Credit: Richard J. Green / Photo Researchers, Inc. In the news: "With Science, New Portrait of the Cave Artist" by John Noble Wilford New York Times June 14, 2012 SD9680 A photographic emulsion impregnated with a radioactive thorium salt reveals the tracks of alpha particles when developed. As Ernest Rutherford & Frederick Soddy found in 1900-1902, the decay of thorium initiates a chain of decays. First one radioactive element is formed, then that decays to another, & so on. This is why the emulsion picture shows the tracks of two or more alpha particles emerging from the same spot: they are the result of successive stages in the decay of a single nucleus. 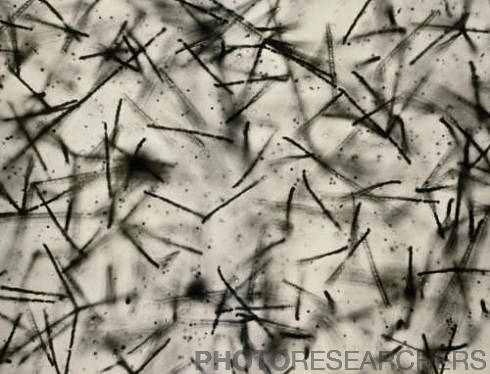 (The length of the alpha tracks in this negative picture is about 0.03 mm). Credit: C. Powell, P. Fowler & D. Perkins / Photo Researchers, Inc. In the news: "In Good Health? 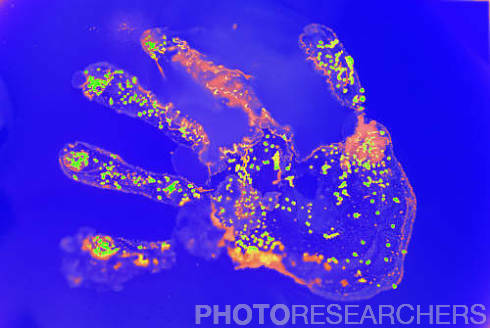 Thank Your 100 Trillion Bacteria" By Gina Kolata New York Times June 13, 2012 BP5502 Bacterial colonies growing in a human hand print on agar gel. A hand was pressed onto the agar and the plate incubated. Under normal circumstances the human body is populated by up to 100 trillion beneficial bacteria that live on or inside us. They help to defend against harmful disease causing bacteria. Bacteria dislodged from skin on this hand's surface have fed on the nutrients in the agar gel and multiplied quickly. A single bacterial cell can become a colony of 250, 000 bacteria in six hours in these conditions. Other colonies outside the hand shape have grown from airborne bacteria. Credit: Scimat / Photo Researchers, Inc. In the news: "Diet Sodas may confuse brain's 'calorie counter'" by Janet Raloff Science News June 13, 2012 3C8127 Polarized light micrograph of fructose (sugar) crystals. Credit: Leonard Lessin / Photo Researchers, Inc. Sleepy Brains Crave Junk Food? 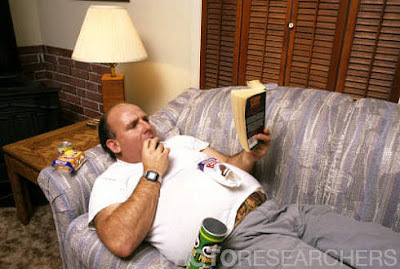 In the news: "Sleepy brains drawn to junk food" CNN June 10, 2012 BJ1942 Overweight man laying on a couch eating and reading a book. MR Credit: David R. Frazier / Photo Researchers, Inc. 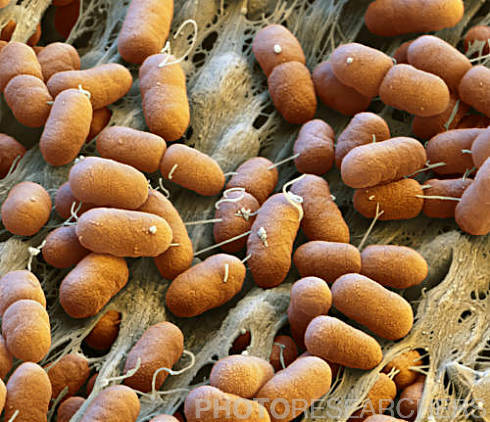 In the news: "E. Coli hits 11 as Officials Race Against the Clock" by Jim Avila ABC News June 8, 2012 BS9536 E. coli bacteria, color enhanced scanning electron micrograph (SEM). Escherichia coli are Gram-negative rod-shaped bacteria that are part of the normal flora of the human gut. Some strains produce a toxin that causes severe diarrhea and can be fatal, especially in the very young or elderly. Magnification: x13,300 when printed at 10 centimeters wide Credit: Eye of Science / Photo Researchers, Inc.
"Please take sun exposure more seriously." In the news: "Slathering on Sunscreen, Early and Often" by Jane E. Brody New York Times June 4, 2012 BA7460 Young woman applying sunscreen to a child's nose. Ultraviolet light rays from the sun can damage skin cells. This can be seen in the form of tanning, freckles, and sunburns. Built-up sun damage may cause skin cancer, making sun protection at early ages all the more necessary. Credit: Laurent / Carola / Photo Researchers, Inc.
BT2727 Close-up illustration showing a cross-section of a cancerous breast cell producing too many HER genes, which in turn produce an excessive number of HER2 receptors. The receptors attract growth factors, which stimulate the growth of more cells. 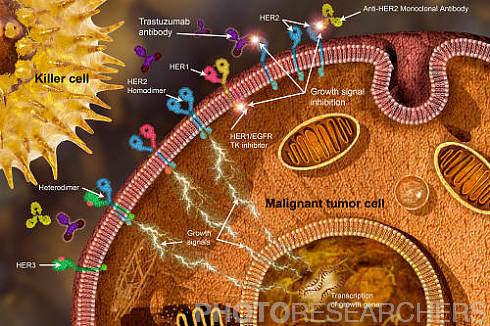 Herceptin (generic name: Trastuzumab) and other antibodies inhibit HER2 receptors and VEGF growth factors. 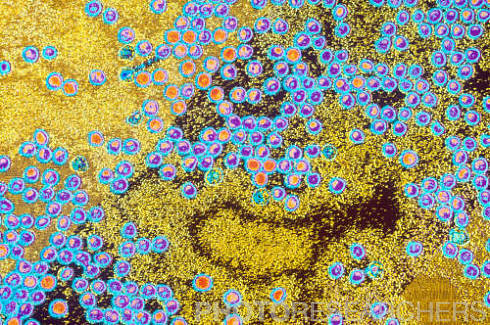 They also attract other elements of the immune system such as the killer cell pictured upper left. Credit: Carol and Mike Werner / Photo Researchers, Inc. In the news: "James Cook and the Transit of Venus" by Dr. Tony Phillips NASA Science June 2, 2012 BN5932 Venus begins to transit the face of the sun, on June 8, 2004. The image shows the mysterious black drop effect which can be seen just before the 3rd contact as the planet Venus transits the Sun's disk. 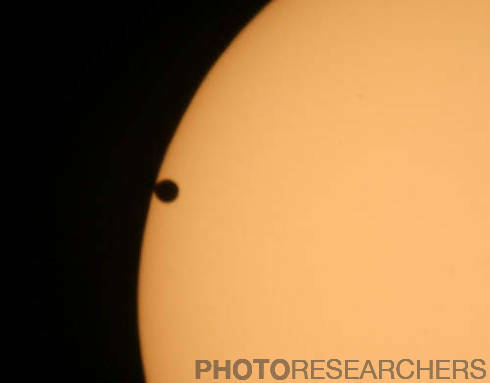 A transit occurs when Venus passes in front of the Sun as seen from Earth. This is the first transit since 1882. Venus transits occur in pairs separated by eight years, with alternating intervals of 121.5 and 104.5 years in between pairs. Only Mercury and Venus can transit the Sun as seen from Earth. 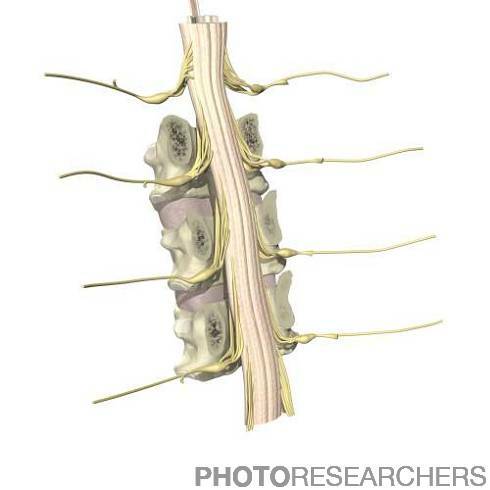 Credit: Babak Tafreshi / Photo Researchers, Inc.
FB7480 Close up of spinal cord I. Credit: Primal Pictures / Photo Researchers, Inc.